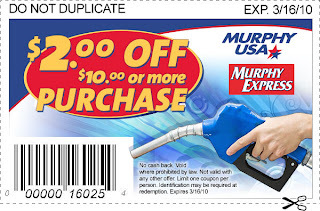 Coupon Mama: Yes a GAS coupon!!!! Now shout Hallelujah for this!! Yes a GAS coupon!!!! Now shout Hallelujah for this!! This is one that you will want to share with those Naysayers we talk about in class...those folks who say "there isn't ever a coupon for stuff I use"...well I think this might just make them a believer. Only good until 3/16. You don't have to become a FAN on facebook, but they give away gas looks like every month so I did just in case they decide to bless me with the next winning gasoline money!! Can I combine this with my 3 cents off per gallon for using my gift card?? If this is one of the stores that allows for FUEL Perks I don't see why not. I hadn't even looked at the list to see if they were or not.